Like every parent I want my children to be well behaved. I want them to use their manners, be respectful, kind, and friendly. I want them to be well adjusted and open to new experiences. I want much for my children. But more than anything, I want them to be grateful! A couple of weeks ago my in laws returned home after a 2 month RV trip across the country. Throughout the trip they sent postcards to the kids, a box of Halloween treats, and my daughter a birthday package. When we went to see them they had a bunch of goodies for the kids including t-shirts, geodes, a book, snacks, and other little trinkets. After looking at everything my children then asked, "Is that all you brought me?" I am sure you can imagine the steam coming out of my ears. In the next sentence they did say "Thank You" without prompting, but it still didn't erase the ungratefulness that they had displayed. Now I must confess...I think I am partly to blame for their ungratefulness. You can call me "The Enabler". I buys toys when we are at WalMart just because, birthdays and Christmas abound with presents, my kids choose multiple snacks when we go grocery shopping, we go to McDonalds frequently, they choose restaurants when we go out, and I could go on and on. But, I'm happy to report that mommy's taking charge and our family is going to get control! With the economy the way it is, our family is trying to be more financially responsible, which means scaling back. One way is cutting back on birthdays. When I would usually throw a huge party for the kids birthdays and also buy a few presents, this year we had small parties with only 4 guests and they each received one present from us. Christmas will also be leaner and I will be putting more thought into what I'm purchasing rather than impulsively buying things here and there. Through the cutbacks, I'm hoping that I will teach my children to be more grateful for what they have and what they receive. They need to learn that everything costs something and you must live within your means. This means saying no to some things, saving up for things we really want, and enjoying what we are lucky to already have. 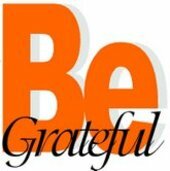 As I hope to teach them this, I realize that I have to make sure that I am also displaying gratefulness. I have to admit that sometimes I can be pretty ungrateful. I find myself often wishing for a certain outfit, purse, shoes, wanting to go out to eat so I don't have to cook, new things for the house...rather than being thankful that I have a variety of clothes and accessories, have food in the fridge and cupboard, and a warm, cozy house to live in. Not to mention a healthy, beautiful family! So my Christmas wish is that I can teach my kids gratefulness through my words, choices, and actions! This is an original post to Philadelphia Moms Blog. Mel also blogs at A Box of Chocolates.